SUBHEAD: The fuel in the precarious Reactor 4 Fuel Pool is several times the radioactivity released by Chernobyl. Image above: A cask of nuclear fuel is lifted and moved by workers during operations to remove fuel rods from a spent fuel pool inside the No.4 reactor building at Fukushima Daiichi nuclear power plant on November 18. From original article. Japan's crippled Fukushima Daiichi nuclear power plant is again the focus of global attention, as the plant's operator enters the most critical stage yet in its attempt to clean up the site. Engineers have started to extract the first 22 of more than 1,500 spent fuel assemblies from one of the reactor buildings damaged in a natural disaster in March 2011. The operation is seen as a tricky but essential step in a complex, decades-long decommissioning process. Mycle Schneider, an independent nuclear consultant, said the removal of 400 tons of spent uranium fuel stored in a precarious state in a pool inside Unit No. 4 is a matter of urgency. "We're talking several dozens of times the amount of cesium that was released during the Chernobyl accident," Schneider said. "The big danger is that through a further earthquake or any kind of impact, the water in the pool gets drained beyond a level that can't be topped up. That would lead to the spent fuel overheating and potentially burning." The cores in three other units, Nos. 1, 2, and 3, suffered meltdowns after the plant was hit by a massive earthquake and tsunami. Reactor No. 4 was offline at the time, but hydrogen from a neighboring reactor got into the building and exploded. Moving the spent fuel rods from the building was made possible only after months of repair work and planning. Workers reinforced the wrecked building and covered it with a steel canopy. A huge crane was installed on top of the new structure. Dale Klein, a former chairman of the U.S. nuclear regulatory commission and head of the Tokyo Electric Power Company's (TEPCO) Nuclear Reform Monitoring Committee, said the removal of the fuel would be "a milestone" for cleaning up the site. "The engineers were very creative in building a new fuel-handling device for the spent fuel in the No. 4 pool," Klein said. "I think the activities that have been most impressive at Fukushima No. 4 for the spent fuel is the hard work, the dedication, and the creativity that the employees have done to move that spent fuel in a safe and secure fashion." 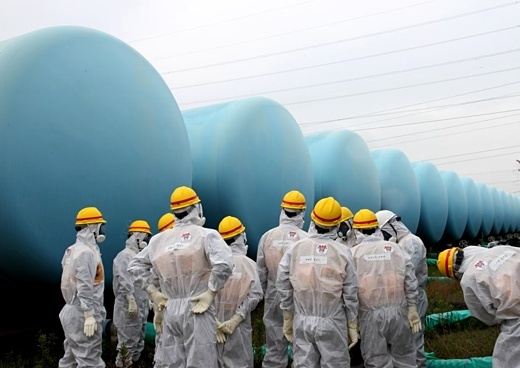 Image above: Japan Nuclear Regulation Authority (NRA) members are seen here wearing protective suits and masks while they inspect makeshift storage tanks. From original article. During the operation, a device will plunge into the storage pool and hook onto a fuel assembly, placing the 4.5-meter-long tube containing dozens of thin rods of highly irradiated fuel inside an immersed cask. A video of the operation can be seen here. The remote-controlled crane on top of the building will lift the 90-ton cask from the pool -- which contains as many as 22 fuel assemblies -- and load it onto a trailer. The cask will be transported to a safer storage pool nearby. The head of the Fukushima Daiichi plant, Akira Ono, said earlier this month the firm expects the operation to go smoothly. "Basically, we're taking the same steps we applied to the decommissioning of other nuclear facilities. So, in that, we're handling a task which we have experience with," Ono said. Yet, experts warn that the manipulation of the rods at Fukushima Daiichi comes with considerable risk. "High radiation is the critical factor," said Komei Hosokawa, a professor of environmental sociology at Kyoto Seika University in Japan. "People cannot go close to the fuel at any time during the operation, whether things go wrong -- or right." The pool has been cleaned with an underwater vacuum cleaner. But tiny pieces of debris may have been left behind, impeding the smooth removal of the assemblies. There is also concern that some of the assemblies may have been damaged and therefore more likely to leak when manipulated. On November 13, it was announced that three of the spent fuel assemblies were damaged even before the 2011 disaster and could not be removed from the pool using a cask. 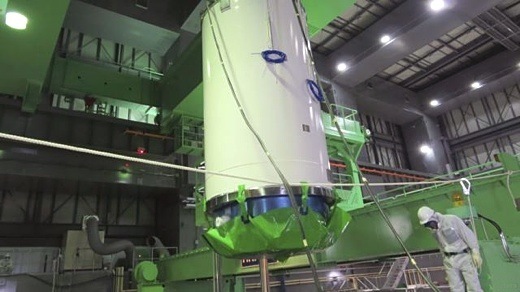 TEPCO said it is "reviewing how to transport these fuel assemblies to the common spent fuel pool." But Hosokawa and Schneider said the worst thing that could happen during the operation would be a cask being dropped onto the wall of the pool, which would result in a loss of water. TEPCO said it hopes to complete the task by the end of 2014, but experts warn that any mistakes would create considerable delays to a decommissioning process that is already expected to last at least three decades. Future challenges include the much more complicated task of removing the misshapen cores of the three reactors that suffered meltdowns. Hosokawa says the situation in units 1, 2, and 3 is a "total blackout." "Nothing is known about where and in what condition the fuel rods are," he said. Another key issue is dealing with large quantities of radioactive water being kept in more than 1,000 tanks at the Fukushima site. The tanks have suffered multiple leaks in recent months. Schneider said efficient international assistance is urgently needed to deal with the numerous looming challenges. "We have seen over the past 2 1/2 years that TEPCO is certainly not in a position to stabilize the site," he said. "The situation has degraded. They are not able to cope with the situation and to invent and develop concepts that sustainably stabilize the site." Schneider said he favored putting together an international task force that would set out concrete proposals to stabilize the site. The team would include the best experts in key areas such as reactive physics, contaminated-water management, and waste management.